North Korea hands over remains of Korean War soldiers to U.S.
PYEONGTAEK, South Korea -- The U.N. Command said Friday that the 55 cases of war remains retrieved from North Korea would be honored at a ceremony next Wednesday at a base in South Korea. 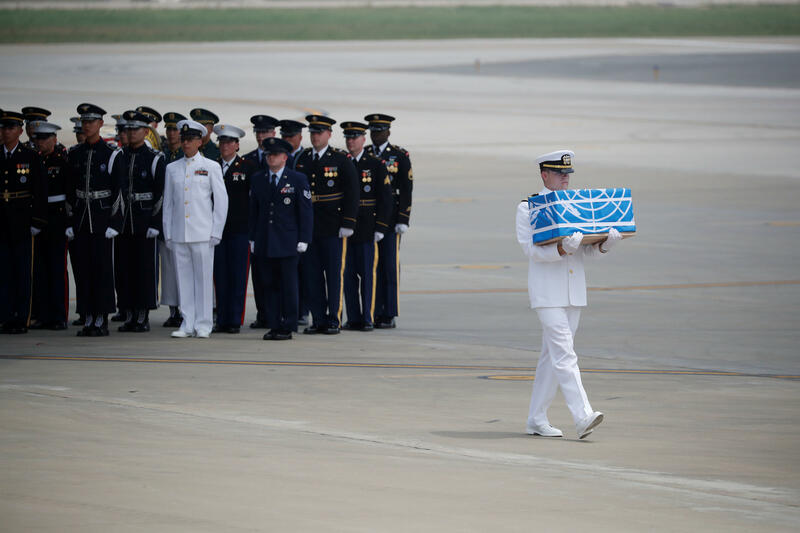 A U.S. military plane flew to Wonsan, North Korea, on Friday to pick up what are believed to be the remains of U.S. servicemen killed in the Korean War. The transfer is meant to fulfill a commitment made by leader Kim Jong Un during his summit with President Donald Trump in June. President Trump tweeted late Thursday that the remains would soon be flown out of North Korea. "After so many years, this will be a great moment for so many families. Thank you to Kim Jong Un," Mr. Trump tweeted. The transfer was done on a highly symbolic date; the anniversary of the signing of the armistice which officially ceased hostilities in the Korean War. An Associated Press journalist at Osan Air Base outside of Seoul saw the plane land, and the White House confirmed that a U.S. Air Force C-17 aircraft containing remains of fallen service members had departed Wonsan, North Korea, on its way to Osan. Details of what specifically the U.S. had picked up were unclear, but reports said previously that Pyongyang would return about 55 sets of remains from the 1950-53 war. About 7,700 U.S. soldiers are listed as missing from the Korean War, and 5,300 of the remains are believed to still be in North Korea. The war killed millions, including 36,000 American soldiers. Rick Downes, who was three years old when his father Hal Downes went missing during the Korean War, flew to Pyongyang to press for the return of not just his father's remains but also those of the 5,300 American servicemen still missing in action in North Korea. "It was all there. The hills that the navigator said the plane went down, there they were," he told CBS News' David Martin. "It's the closest I've been to him proximity wise since I was 3, and just you never forget that." Despite soaring rhetoric about denuclearization ahead of their meeting, Mr. Trump and Kim's summit ended with only a vague aspirational goal for a nuclear-free Korean Peninsula without describing when and how that would occur. Friday's handover will be followed by a lengthy series of forensic examinations and tests to determine if the remains are human, and whether they are actually American or allied troops killed in the conflict.